Charles M. Schulz: ‘All you need is love. But a little chocolate now and then doesn’t hurt.’ I tend to agree. It’s getting close to Valentines Day and hence my mind has started to wander towards chocolate things. 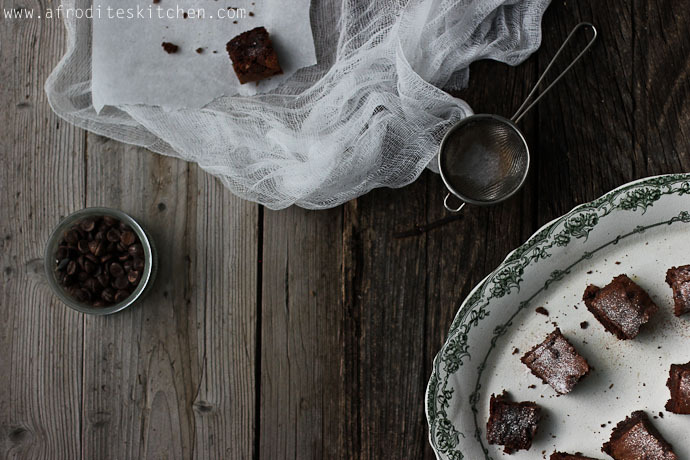 This year, I couldn’t resist combining a healthy local ingredient into my brownies – carob – which was known as “black gold” in years gone by in Cyprus. Carob sort of reminds me a little bit of coffee, a little bit of chocolate, and a little bit of treacle. It’s unique, and tasty, but very strong in flavour. 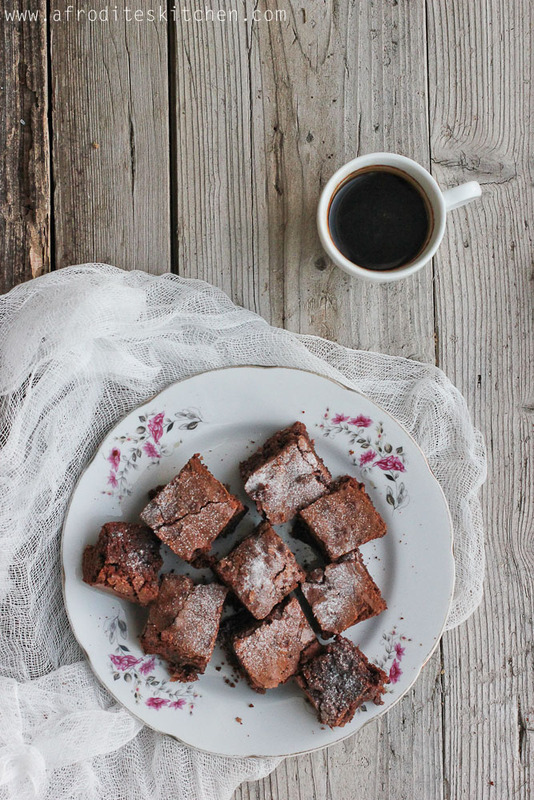 Since I still wanted these brownies to taste chocolate-y, I only added a little carob, otherwise the chocolate taste would be lost and the flavours would be confused. These brownies are chewy and gooey type and have a crackled top. I cooked them for 40 minutes and when I tested them, I thought they were a bit undercooked but took them out anyway, because I didn’t want to overcook the gooey center which I love. 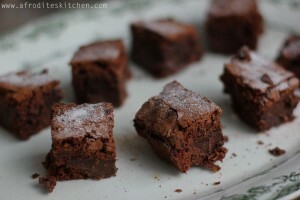 As a result, these brownies are pretty fudge like, but that’s the way I like them. You can cook them a bit longer (5 more minutes) if you want a more cake-like texture. Not so good for the diet, … but, as Charles M Schulz said, a little chocolate now and then doesn’t hurt right? 1. 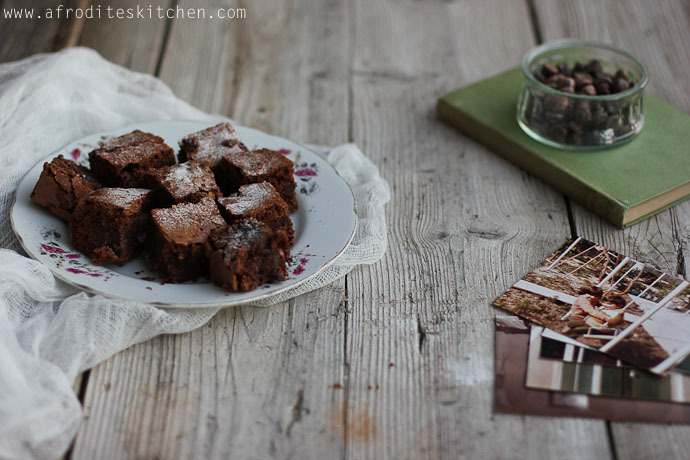 Line a 23×32 cm brownie tin with non stick baking parchment. 2. Preheat the oven to 190C. 3. Gently melt 200g chocolate and unsalted butter together, stirring until smooth and glossy. Set aside to cool slightly. 4. In another large bowl, beat the eggs, caster sugar, light brown sugar and vanilla extract for 3 minutes. This is to give the finished brownies a velvety texture. 5. Sift flour, baking powder and carob powder into the sugar mixture. 6. Pour in the melted chocolate and butter mixture with 1/2 tsp sea salt. Beat briefly to combine and stir in another 100g finely chopped dark chocolate (if you want a more chocolatey taste) and/or 1/2 cup chopped roasted pecans. 7. Scrape into the prepared tin, making sure that the edges are a bit “higher” than the center by moving the mixture towards the edges to almost create a dip in the center. (This is so that the center doesn’t rise too much.) Place in the oven and immediately reduce the oven temperature to 180C and bake for 35-40 minutes until almost firm in the middle. Test with a toothpick. Mine was still a bit “gooey” in the middle, but I like it that way. In addition, don’t be alarmed if your brownies rise a lot, they will fall down once you bring them out of the oven. 8. Once baked, remove from oven and let cool in the tin for at least 30 minutes before you begin to chop the brownies into about 16 bars or 32 small squares. They will keep in an airtight container for up to four days.